I briefly mentioned a few days ago my excitement at this wonderful new book, Shadow of the Torturer, which is the first of four books in Gene Wolfe's Book of the New Sun Tetrology. This is my first "Science Fiction Academy" entry in a while, partly because I've been reading a bit less this past couple of months (spending more time writing, which is fine in the short run, but in the long run I'll have to stoke the fire by reading more), partly because I've been reading less science fiction stuff, and partly because I've finished a few books that I haven't gotten around to discussing yet. Shadow of the Torturer is a great way to start this blog feature rolling again, because this is an incredible book. I feel like I've just stumbled onto one of my new, favorite writers in Gene Wolfe. This past few years I've sorted back through various science fiction of the sixties, seventies and eighties (and to a lesser extent those "classics" in decades before and after that range), and I've been struck more than anything else by the generally very poor quality of the writing in the genre. There are notable exceptions, like the poetic prose of Ray Bradbury, and the breezy, masculine confidence of Heinlein, but far more sf writers create prose at a much lower level than the quality of the ideas. 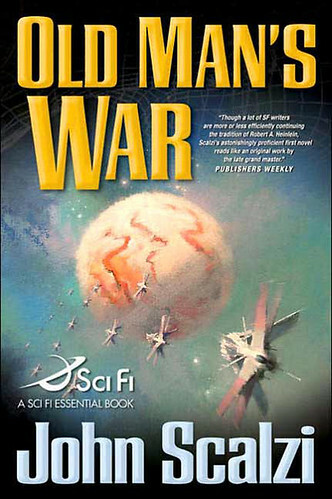 It's such a relief to come across someone like Joe Haldeman, who writes in a clear, straightforward way that never interferes with the story or makes me roll my eyes. Gene Wolfe, though, may be the best pure writer ever to work in the science fiction or fantasy genres. This book applies elegant, poetic language to the compelling story of a torturer expelled from his guild for taking pity on a "client" (torture victim) with whom he'd fallen in love. The story is expressed with great sensitivity, and delves into metaphysical and ontological questions along the way. If there is one drawback, it's that this first book in the series ends rather abruptly. This is remedied by the recent release of Shadow of the Torturer together in a single volume with Claw of the Conciliator, the second New Sun book, so the reader may continue on without too much frustration. I can imagine readers being frustrated with this one when it came out, though, with no sequel at hand until a year or two later. This work is so accomplished, so compelling and overall so successful that I find I have less to say about it than I would most novels. This book belongs on the shelf of anyone who claims to love science fiction or fantasy, as it somewhat straddles the line between the genres. It feels like a fantasy novel, with swords and armor, horses and witches, and dark towers. Yet the story is based on a far-future Earth, where much has changed, and virtually everything we now know has been forgotten. I've seen this series referred to as "science fantasy" and though that's not a term I normally like, here it fits. The clearest recommendation I can make is that I not only intend to finish the series, but the related "Long Sun" and "Short Sun" series, and possibly everything else I can get my hands on by Wolfe. Truly one of the best things I've read in a long time.